Mummified 'demon' hand and gambler's equipment. Reminiscent of 'Cheiro's Hand'. The oldest holder of the 'Hand' whom we have been able to trace was a man named Morgan Robertson. Born in 1861 in the United States, he spent the first part of his life at sea, travelling to the most exotic and enigmatic parts of the globe. He probably brought the Hand back with him from some far-flung country. Perhaps it was stolen from a monastery, traded in an Arab bazaar or purchased from an Indian sorcerer; it's true origin is lost in time. It is likely that Robertson, a spiritualist known for his knowledge of the occult and the invisible world, significantly 'amplified' the magic power of the Hand. There is a good chance that for a brief time it was owned by noted English palmist Cheiro, but there is no conclusive evidence of this. It is also possible that there was a second hand that was brought back to England at the same time and then sold by Morgan Robertson to Cheiro - the latter explaining the former. After all, the majority of humanoid creatures have two hands. (Provided it has been correctly 'activated', the Hand gives its legitimate owner curious talents: extraordinary dexterity, the gifts of writing and precognition, sensitivity to the invisible world - all of which are capabilities that he holder of the Hand will already have, but which will then be developed to an incredible degree. Inspired by what he called his 'Psychic Guide', Morgan Robertson started writing tales of adventure set on the high seas, full of pirates and shipwrecks. These secured him a certain degree of fame - but clearly not enough to satisfy him! (The Hand possesses another power: It can make a single, unique wish come true for the holder. In 1912, at around 50 years of age, Morgan Robertson asked the Hand to ensure that at least one of his novels would go down in history. On the night of 14 April 1912, Futility became the most bizarre novella of all time. Published in 1898, it predicted with astonishing accuracy the wreck of the Titanic. Morgan Robertson's quest for fame cost more than 1,500 people their lives. He died in 1915, his talent dried up. In the meantime, the Hand had been sold on to a young steward working for White Star Lines; unfortunately, we no longer know his name. He would spend his long transatlantic journeys at sea playing poker and gin rummy with the passengers; he was aboard the Titanic on its maiden voyage. During the trip, he learned that a fire had broken out in one of the coal bunkers on board (right at the start of the trip), and that there was a chance it would destroy the ship. Panicked by news of the fire, and knowing that despite the efforts of 12 men to put out a fire that raged on day after day, he activated the Hand and called on it to extinguish the fire. He did not have long to enjoy the powers of the Hand. 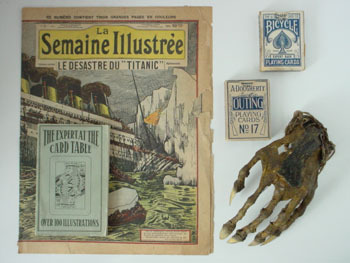 Following the rule, he sold it to a poker player aboard the ship -- not long before the Titanic hit the iceberg and sank. A radical method for putting out a fire - to say the least! The steward went down with the ship. We cannot state with certainty that the gambler in question was Alvin Clarence Thomas, although we think it was him, but it was during this period that he took possession of the Hand. He went on to become one of the most famous gamblers of his time, going by the nickname of 'Titanic' Thompson. He made and lost fortunes during his lifetime, and was well known for winning the most unlikely bets. As a poker player, cheat, golfer, betting man extraordinaire and accomplished marksman, he took full advantage of the powers of the Hand. He was ambidextrous and could deal any poker or blackjack hands he wanted to whomever he wanted. The Hand was his most closely guarded secret. I don't think he ever used the Hand to make a wish, but in 1970, nearing the end of his life and perhaps fearing damnation (that was one wager he did not want to make), he got rid of the Hand. An American magician by the name of Tom Palmer acquired the Hand next. It was at that point in Palmer's life that he changed his plans and readopted the name he was christened with: Tony Andruzzi. Already famous for writing such works as Modern Illusions, The Tie Pitch, The Vampira Act and The Famous Flea Act; he focused his energies on a form of strange conjuring that would become known by the name 'bizarre magick'. He promoted this advanced form of magic and became its most ardent defender, writing in the pages of The New Invocation. Bizarre magick subtly combines the arts of the sorcerer and the conjuror. In 1989, he found himself in difficult financial straits so he asked the Hand to help him. In accordance with the rule, he then got rid of the hand, giving it to me during one of my trips to the United States. Not long afterwards, his beloved wife Gloria died in a tragic accident. The insurance settlement he received would never make up for the loss of his loved one and he literally let himself die of remorse - leaving our world on 22 December 1991 at the age of 66. I am the current guardian of the Demon Hand. In December 1993, I won first prize at the MacMillan close-up magic competition in London, one of the most prestigious events in Europe. Not long afterwards, my first book was published in the United States - securing me a certain degree of fame. But the power of the Hand weighs down more heavily with every passing day. Other 'enchanted hands' can be found in the Surnateum's collections: the spirit hand of Anna Eva Fay, the Quena Ollantay, a Hand of Glory, the Yeti paw and the hand of Cleopatra. The magic of hands is more developed in the Muslim world, where they are used as amulets to protect the wearer from demons. It would appear that the entity linked to the object uses the object as a glove to once again manifest itself in the real world.